A public utility in the Pacific Northwest that relies on hydroelectric power developed a comprehensive and efficient shoreline management system for the shorelines around its dams' reservoir that relies on GIS. In the 1930s, less than half of Grant County, Washington, had electrical service. Rural residents formed a grassroots organization to create a countywide public utility district that would provide electrical service for everyone—and thus grow the economy and provide a higher quality of living for the economically depressed region. Grant County's Shoreline Management Plan (SMP) asks landowners to apply for a variety of permit types, such as a long-term use permit or a short-term-use permit for an event. In 1938, residents voted into existence the Grant County Public Utility District No. 2 (Grant PUD). A quarter century later, Grant PUD had built two dams on the Columbia River: the Priest Rapids and Wanapum, together known as the Priest Rapids Hydroelectric Project. Today these dams generate over 2,000 megawatts of electricity. More than 46,000 county residents directly benefit from the hydroelectric project—and so do millions more, served by 23 northwestern utilities that purchase Grant PUD energy. In 2008, the Federal Energy Regulatory Commission (FERC) approved another 44-year license for Grant PUD that will allow it to continue operating the project. In April 2013, FERC approved the utility's Shoreline Management Plan (SMP) to protect the two dams' reservoir shorelines. To support the SMP, Grant PUD needed a database system that inventoried the shoreline, tracked permits, and monitored permit compliance. "In knowing that, we wanted to choose something structurally sound that we can build upon," said Lisa Anderson, a lands specialist for Grant PUD. "We recognized a need to have a comprehensive system that would tie all the big pieces together, including shoreline inventory, permitting, and compliance monitoring." Over many years, homeowners had built docks, trails, and landscaping features along the shore. Some had permits; others didn't. The result was a Grant PUD-owned shoreline that—in places—looked like private property and was, therefore, less than welcoming to public recreators. The FERC-approved plan required protecting natural and cultural resources as well as providing public recreation. Another requirement—part of a monitoring and compliance plan FERC approved in 2013—identified periodic inspections and reports on land-use compliance. In the past, GIS had helped the utility manage land assets, make maps, educate shoreline homeowners, and provide district services. Now, Anderson said, "There is an increasing awareness throughout the district of what GIS really is and how it can be used as a management tool." Based on this previous experience, Grant PUD turned to GIS as the primary application to support meeting its SMP requirements. "It was time to really take a comprehensive look at the shoreline and see what was there and what people were doing," Anderson said. Grant PUD hired Erlandsen & Associates, a GIS services and engineering company in the state of Washington, to complete a GIS needs assessment and implementation plan. Erlandsen outlined the development of a shoreline management GIS database that supported tracking and monitoring of the shoreline inventory and permits. Erlandsen recommended using ArcGIS for Server to store and distribute the database. In its implementation plan, Jeff Berry, a senior GIS analyst and the author of Erlandsen's plan wrote, "ArcGIS [for] Server will allow the PUD to centralize GIS data in an enterprise database, support mobile GIS operations, and serve web-based GIS applications to PUD staff." Erlandsen also recommended developing a suite of GIS applications for desktop, web, and mobile. The first of these, an ArcGIS for Desktop extension, lets GIS staff administer the shoreline management geodatabase and configure and monitor permitting and inspection tasks. 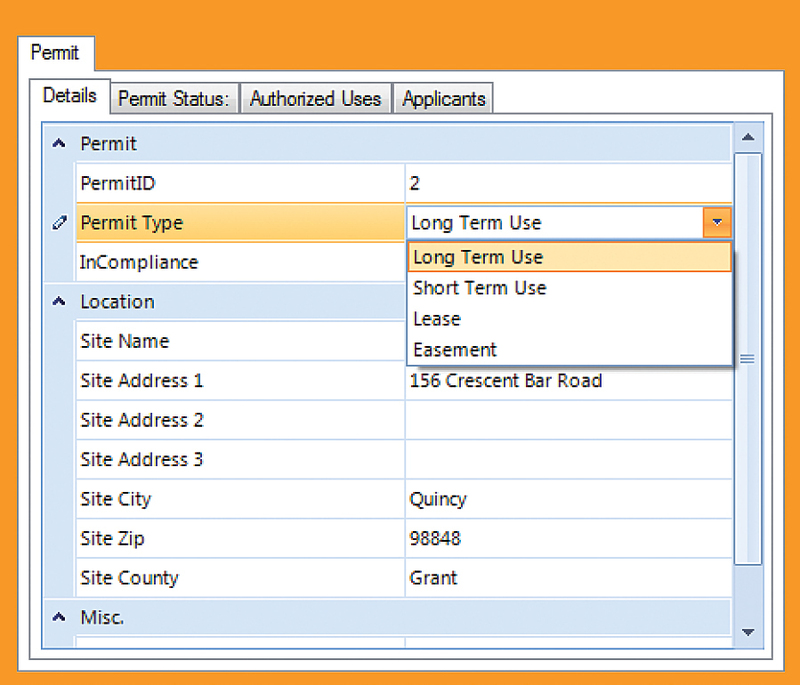 The second application, a web app, enables planning staff to track and update shoreline permits through the approvals process. The final application, for Windows tablets, that lets field staff generate compliance inspection reports on shoreline inventory and permits. All three applications use map services published by ArcGIS for Server. Edrie Risdon, Grant PUD lands specialist, was excited to take the Tracker app for its first run. With these applications in place, Grant PUD could effectively issue and track shoreline permits, monitor permit compliance, and reliably track shoreline inventory—thus giving it a much clearer understanding of how people use the project shorelines. Grant PUD already had licenses for ArcGIS for Server with its Esri enterprise license agreement (ELA), so deploying ArcGIS for Server created no additional cost. For the initial SMP effort, the GIS team built a customized data dictionary with TerraSync, software for Trimble mobile devices that facilitates GIS data collection in the field. The dictionary lets workers without GIS training instantly capture shoreline inventory data by selecting from predefined feature sets. "We set it up to be structured in a way that we could just get up and go with it," Anderson said. Crews swept the shoreline for a full inventory in 2010 and updated this in 2013. The second sweep put crews on boats and on foot to gain new vantages. Crews identified both noncompliant features (e.g., nonpermitted docks) and compliant features (e.g., approved landscaping). Grant PUD also utilizes high-resolution aerial imagery, acquired in March 2014, as a backdrop layer to digitize shoreline features, supplementing and updating the original inventory. "We can save field time and update the inventory even when the snow is flying outside, thanks to this aerial data that will allow us to refine our dataset from the comfort of the office," Anderson said. Grant PUD notified homeowners it would revoke all existing permits in 2015 and requested that homeowners submit new permit applications to homogenize all permit records in the new SMP. Moving forward, the utility plans to use the mobile GIS app from Erlandsen to complete additional inventory mapping and report on compliance inspections. In addition, crews can use the app to support private landowners through the permitting process. The app shows homeowners where their property boundaries exist in relation to Grant PUD properties and how their permit will affect the landowners' property use. "We will be able to update the inventory on the screen as we go along," Anderson said. "We can spatially account for unauthorized use, whether a dock or landscaping feature has been extended, or whatever the case may be, in the field." 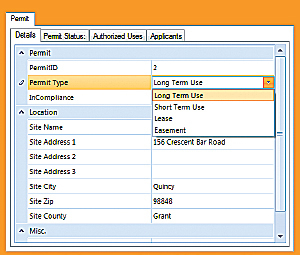 Grant PUD is meeting FERC requirements while gaining an efficient permit and compliance tracking system. The elimination of redundant data entry has already increased efficiency. The suite of GIS applications encourages the utility's Natural Resources Department projects and also emerging projects in other departments. Perhaps most impressive is that most of the effort has been proactive. With the 44-year FERC license, vision is critical. Anderson has already met with Esri staff to discuss setting up Portal for ArcGIS—a firewall-based version of ArcGIS Online—to secure information. A new server and Portal for ArcGIS were installed in December 2014. The goal is a protected shoreline everyone can enjoy. "We believed if we thought about the long term, we'll ultimately be saving time and money," Anderson said. "We will be able to capitalize on this in a big way. It makes sense to everyone," Anderson said. But, she added, "It's an incremental process." 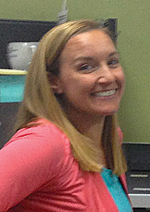 Campaigning for and getting the ELA were first steps, Anderson said. The installation of ArcGIS for Server was the second, and finishing implementation of the shoreline management system is the next. At a recent rollout to the lands manager and shoreline administrator, Anderson got good feedback. "There were several mentions of, 'This is awesome.'"